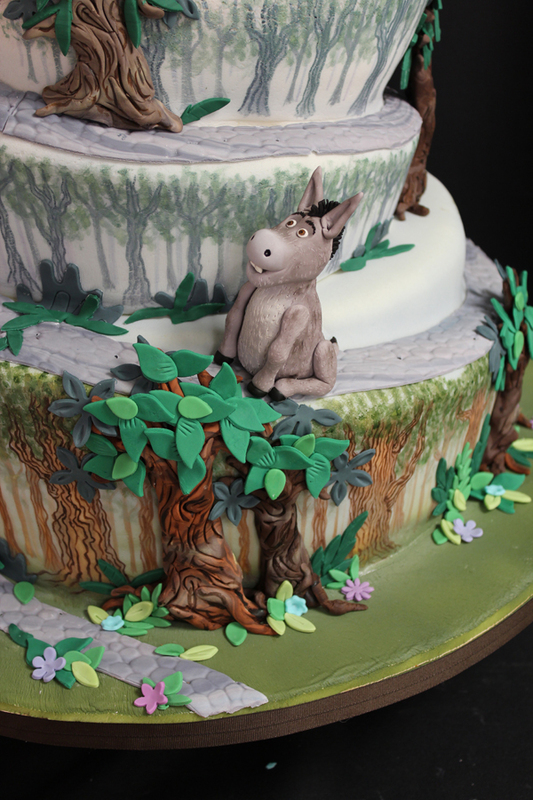 Last week we made an exciting cake for a couple getting married who are both animators, for Dreamworks no less. 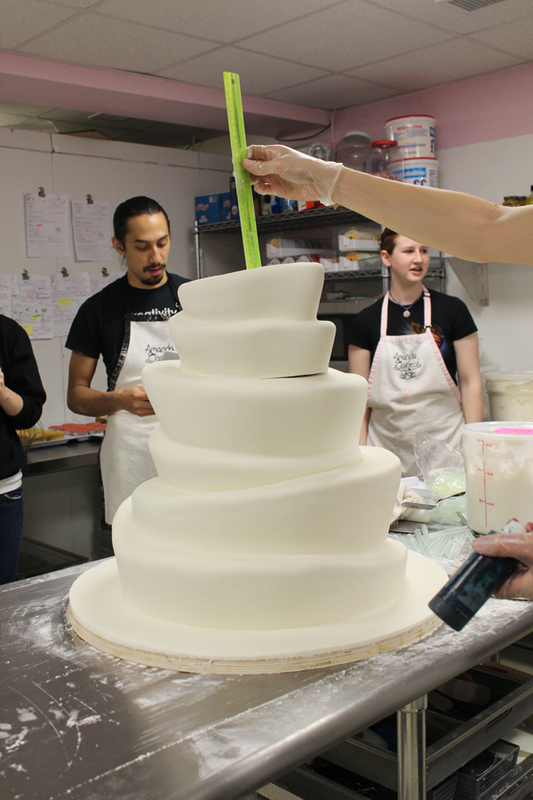 It was such a fun cake to design and decorate that we documented its entire creation. 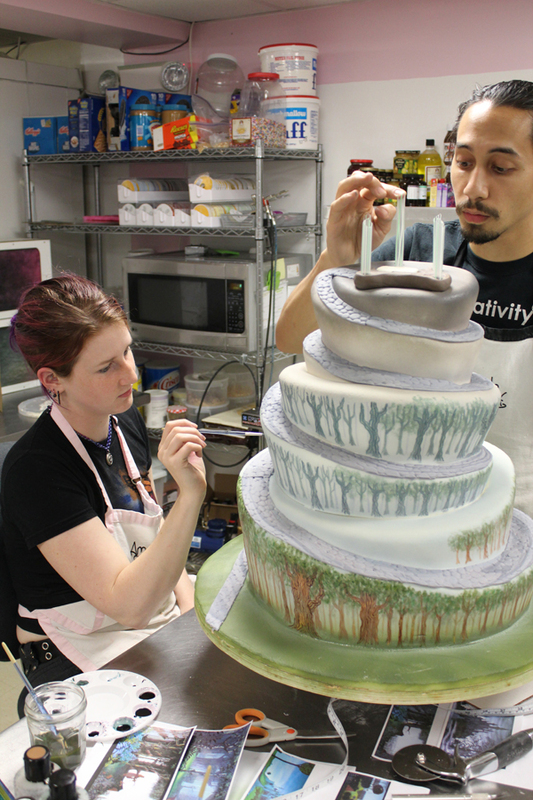 Hope you enjoy some behind the scenes shots of one of our biggest, most detailed cakes ever. 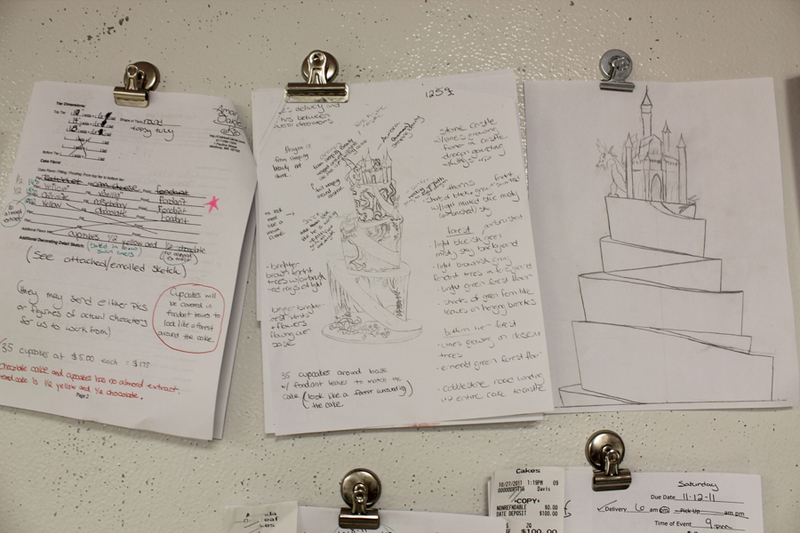 The order form and sketches. 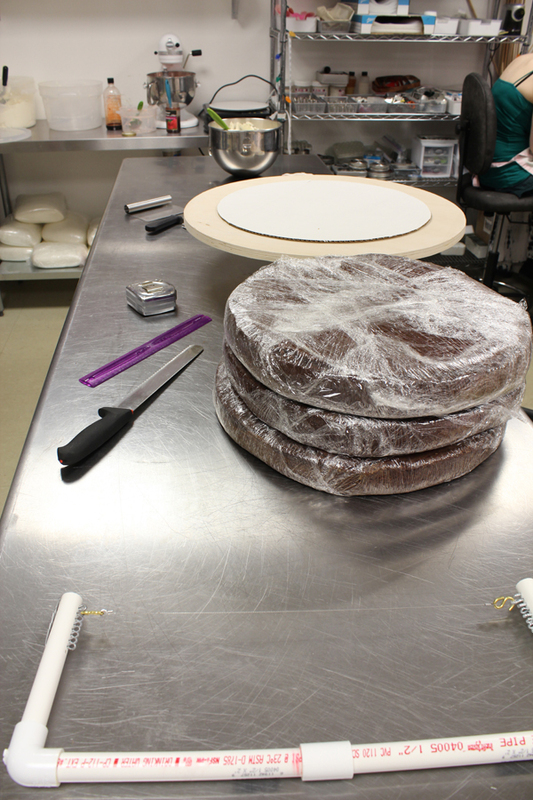 Cake is baked, ready to be stacked. 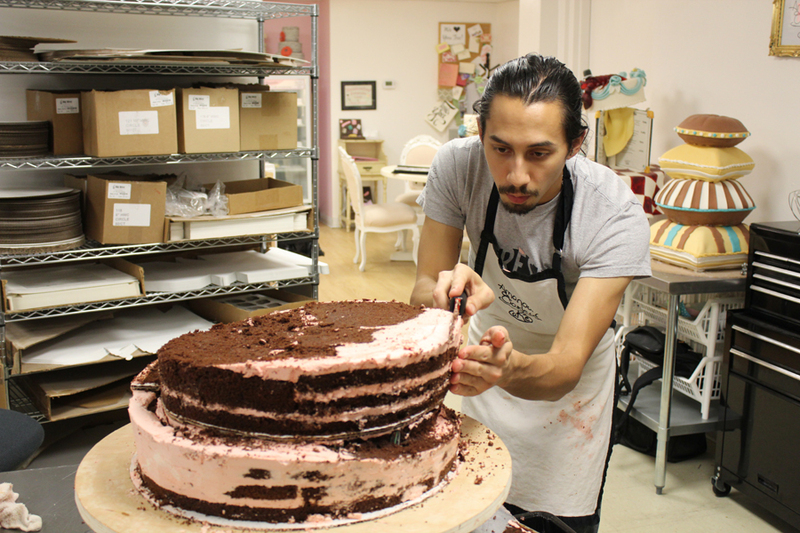 Tim sculpting the bottom tier. 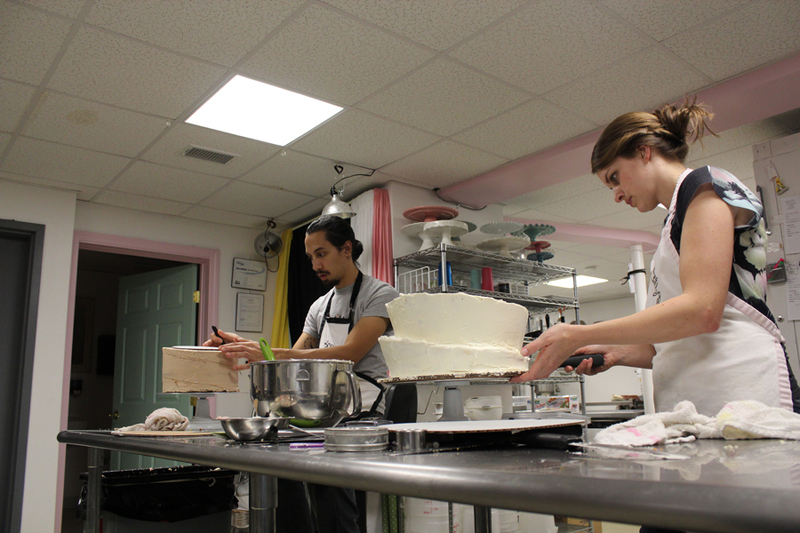 Amanda and Tim crumbcoating other two tiers. Cake has been fondanted and stacked. Ruler measures the approx height of the castle. Kat airbrushed, and is almost finished painting. Tim gets ready to stack the castle on top. 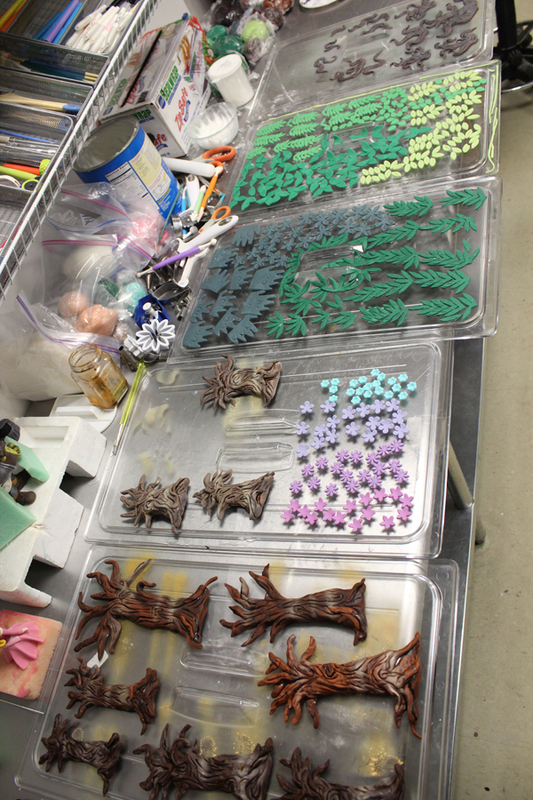 All the fondant leaves, trees and bramble are ready to go on. Amanda piping thorns on the bramble. Ta Da. Finished cake complete with figurines. The forest scenery, princess and dragon is all from Sleeping Beauty. 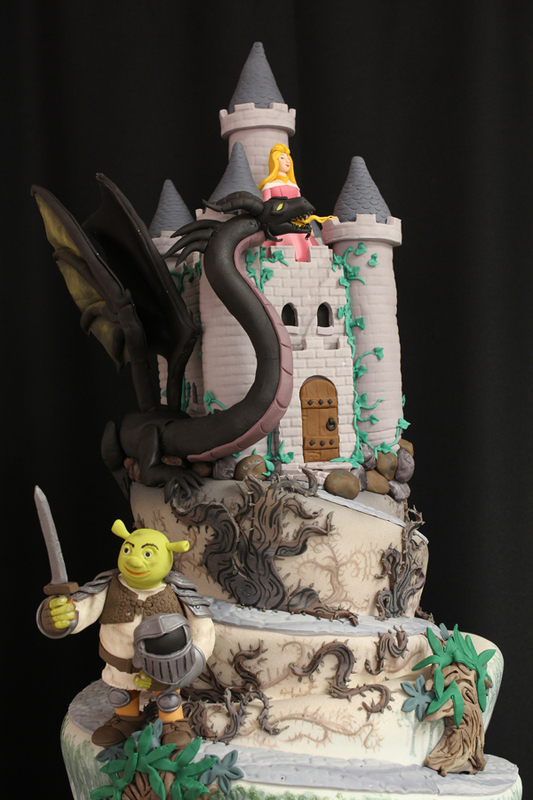 Then we add Shrek and Donkey who are running up to the castle to fight the dragon to save the princess. Classic. Because this cake is all about the detail a couple close up shots are in order. 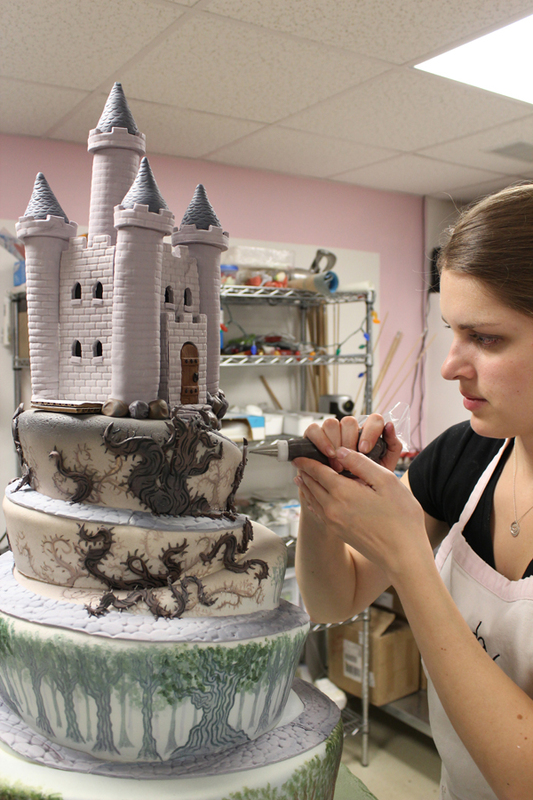 This was one of our favorite cakes because of all the layers of complexity: it was airbrushed, painted, fondant decorations were stuck on, we then painted and airbrushed on the fondant decorations and then stuck on 3D figurines all on a topsy-turvy, spiral road cake with a castle, princess and a dragon on top. Annnd we delivered it to an actual castle. Pheww that was fun! Most Beautiful cake I have ever seen! Did it taste as good as it looks? I love this! The step by step is amazing to see all of the pieces (and work!) that went into the cake. Thank you for making such a beautiful cake and helping my great-niece and her mate to have the “fairy tale” wedding they’d dreamed of. 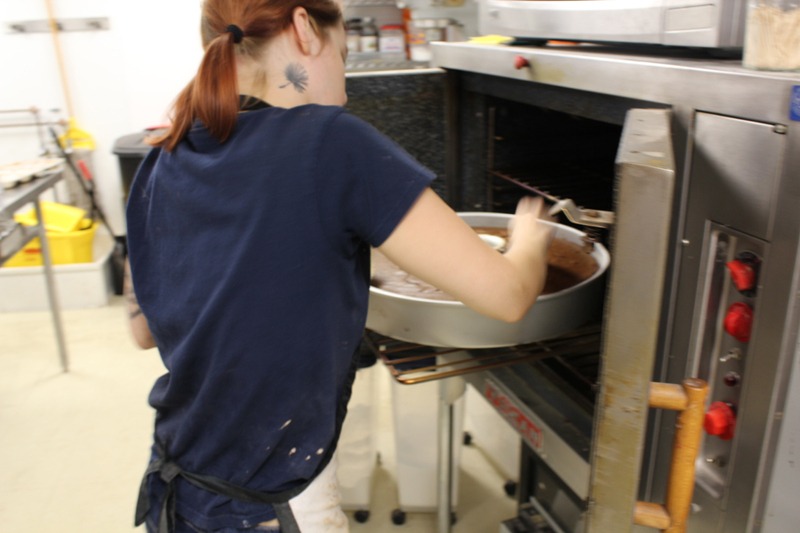 It was fun to see the pictures of the cake being “produced”. Wow! This is awesome! I love the amazing detail on each tier of the cake. Shrek and Donkey are so cute and I love the dragon so much! The cake tasted as amazing as it looked! My question is this…how did you deliver it in one piece??? Well done! 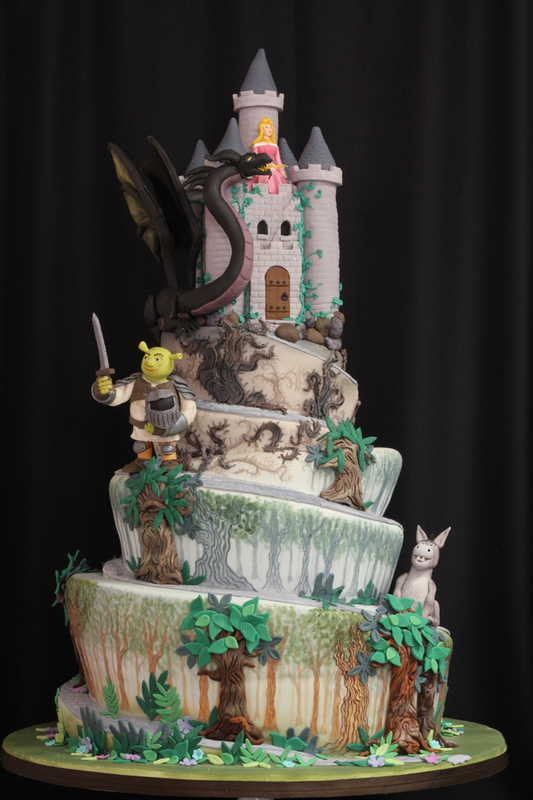 You made this amazing work of art for my son’s fairytale-themed wedding…..words cannot describe the reaction when people saw it – AND it was super delicious. I think as many photos were taken of the cake, as the bride and groom! Much too painful to watch it being cut, though – like a Rembrandt being destroyed. Kudos to your amazing team for creating such a masterpiece! I think this cake needs to be on the cover of a magazine! So truly cool. I found my cake maker for my daughter’s wedding. Although she is only 8 now, no sense waiting til the last minute, I already found my fav animators for the rest of the wedding design team!!!! The cake was amazing. My 13 year old son took about 20 pictures of it and couldn’t wait to send a picture of it to his friends. Thanks for helping to make my niece and nephew in law’s fairy tale wedding perfect. You are truly the Ace of Cakes!!!!! !